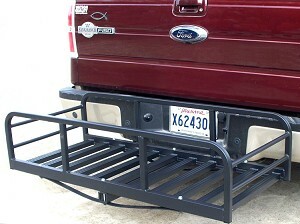 Here’s a hitch receiver cargo carrier with the frame and capacity to do some major hauling! The Hitch-N-Ride Magnum is a whopping 50” wide, 22” front-to-back and has 12” sides. It has a weight capacity of 500 lbs and has a super-strong aircraft aluminum frame for handling “rough n’ tough” loads. The Hitch-N-Ride Magnum comes with durable, good-looking powder-coat finishes. The Magnum Hitch-R-Ride only weighs 20 lbs and ships by UPS. It is ideal for use on pickup trucks, autos or SUV’s with 2” hitch receivers.